Carlos Cruz-Diez began his studies at the Escuela de Artes Plásticas y Aplicadas de Caracas (1940-1945) and continued studying advertising in New York (1947). Upon returning to Caracas, he worked as a graphic designer, attended the Taller Libre de Arte, and painted in a social realist . In 1954, he presented his first abstract works, and in 1955, he moved to El Masnou (Spain) and traveled frequently to Paris, where he visited Le mouvement (Galerie Denise René, Paris). This exhibition launched kinetic art, marked the beginning of his friendship with Jesus Soto, and triggered his interest in optical-kinetic investigations. In his works at this time, including Parénquimas and Construcciones en cadena, he studied movement, the relationship between form and color, and the animation of the pictorial surface. In 1957, Cruz-Diez returned to Venezuela. He delved deeper into optical producing works such as Vibraciones en el espacio (1958) and Doble animación en un plano (1959). He refined his findings in 1959, with the first works of the series Color aditivo and Physichromies. 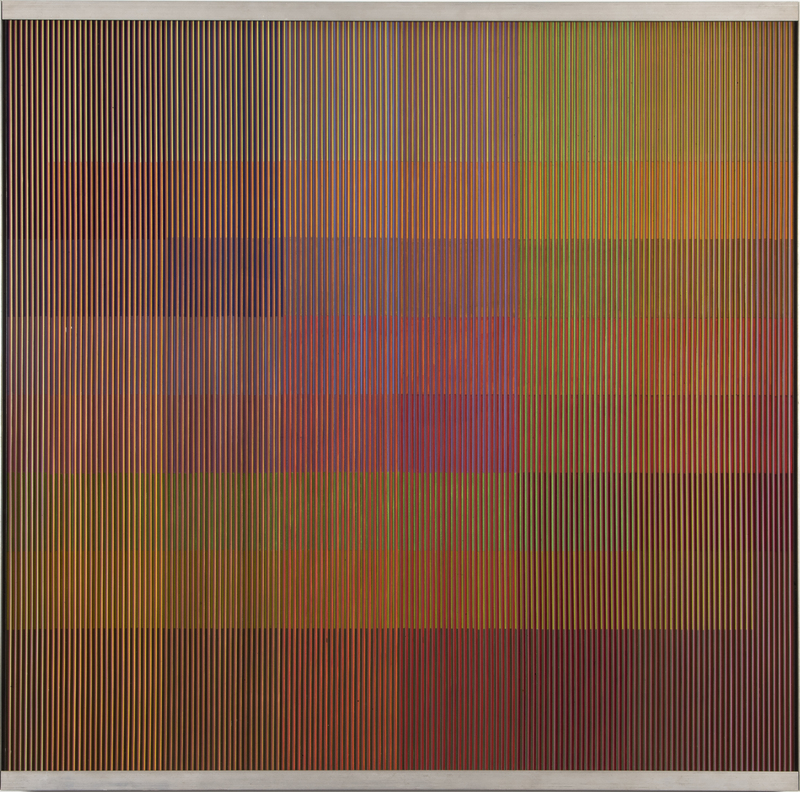 In the former he alternated very fine lines of different colors to generate, in their connecting points, a third color, and in the latter he added small perpendicular layers to the main plane of the work that, adding or subtracting a color, created effects that multiplied the dynamic character of the piece in response to the environment’s lighting and the position of the observer. 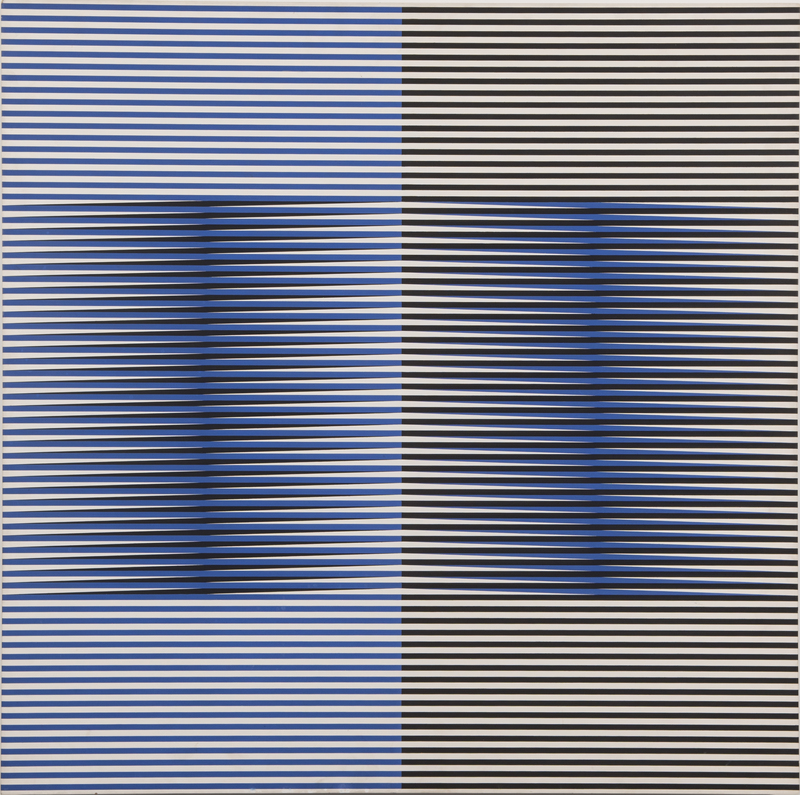 Cruz-Diez moved to Paris in 1960, where he continued his investigations with color and produced a number of works that included Inducciones cromáticas (1963), in which he duplicated the phenomenon of the retina’s persistence on the plane of the work to generate complementary colors. 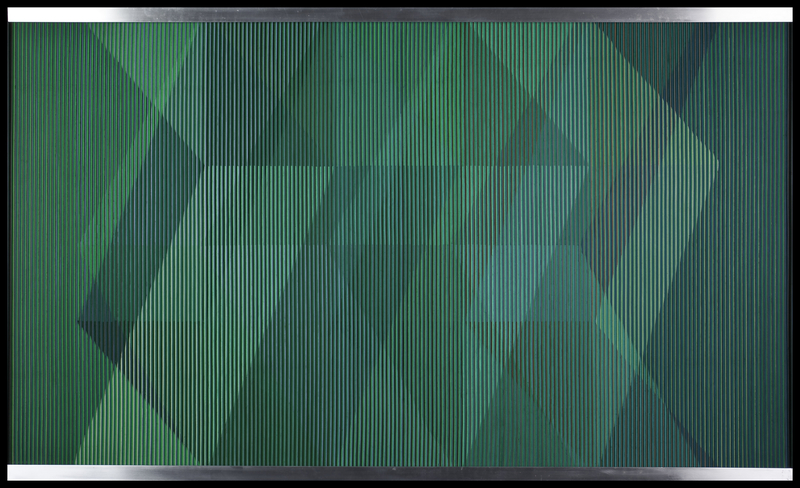 In the Cromointerferencias (1964), he superimposed on the support planes panels of transparent colors and lines that, when activated either manually or automatically, produced new colors in the retina of the spectator. In Transcromías (1965) transparent color l;auers were suspended in space in different planes to create ambiguous visual situations and in Las Cámaras de cromosaturación (1969), he used isolated or contiguous spaces that the spectator penetrated or crossed, causing an altered chromatic perception. In 1971, he received the Premio Nacional de Artes Plásticas. 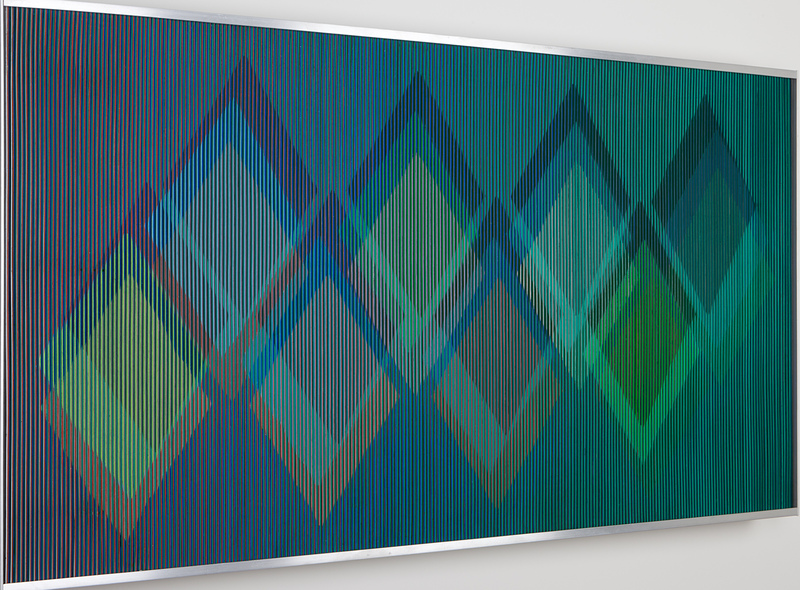 At the end of the 1960s, Cruz-Diez began to make urban installations and works integrated with architecture. Amongst the first were Chromosaturation pour lieu public (Paris, 1969), followed by installations in the streets of Caracas within the framework of the program “the artist and the city” (1975), which he repeated in several American and European cities in the following decades. He also made the Ambientación cromática for the Simón Bolivar International Airport (Maiquetía, Venezuela, 1974), the Ambientación cromática for the Central Hidroeléctrica Simón Bolivar (Estado de Bolivar, Venezuela, 1977), and Physichromie for the Station Saint-Quentin-en-Yvelines (France, 1980), among others. In recent years, Cruz-Diez’s work has been featured in retrospective exhibitions, among them De lo participativo a lo interactivo (Fundación Corp Group Centro Cultural, Caracas, 2001), (In) Formed by Color (Americas Society’ s Art Gallery, New York, 2008), and Color in Space and Time (The Museum of Fine Arts, Houston, Texas, United States, 2011), a touring exhibit that was also presented at the Museo de Arte Latinoamericano (Buenos Aires, 2011), the Pinacoteca do Estado de São Paulo (Brazil, 2012), and the Museo Universitario Arte Contemporáneo (Mexico D.F., 2012). Carlos Cruz-Diez: (In) Formed by Color. Nueva York: Americas Society, 2008.